We BELIEVE that in order for your dog to get the best care you need to know how you can help them heal. Used by tens-of-thousands of pet owners just like you since 2007. You will have the confidence and security knowing that you can actually help your dog heal. Step-by-Step instructions on what you need to do from day one to prepare your home for the best recovery. The Master Plan providing detailed weekly instructions and guidelines on exactly what you need to do day-by-day, week-by-week. Cold Therapy Learn why and how icing is the best anti-inflammatory and helps control pain in the early days after surgery. 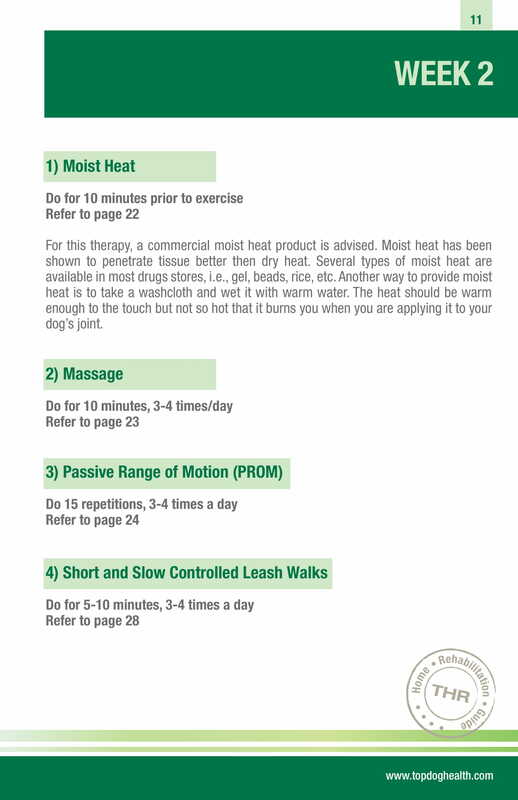 Moist Heat Learn about the benefits of moist heat therapy; why it is important and how exactly to do it. Massage One of the most under-valued therapies. You don’t have to be a skilled massage therapist to transfer the power of touch. Passive Range of Motion (PROM) Though simple in theory most people don’t truly understand its benefits and exactly how to perform this essential therapy. Stretching Immensely beneficial yet potentially detrimental, you will learn the basics of safe stretching. Slow Controlled Leash Walks Simple in concept and one of THE MOST IMPORTANT exercises you can do, yet 90% of dogs owners don’t get it. We detail exactly what it means. 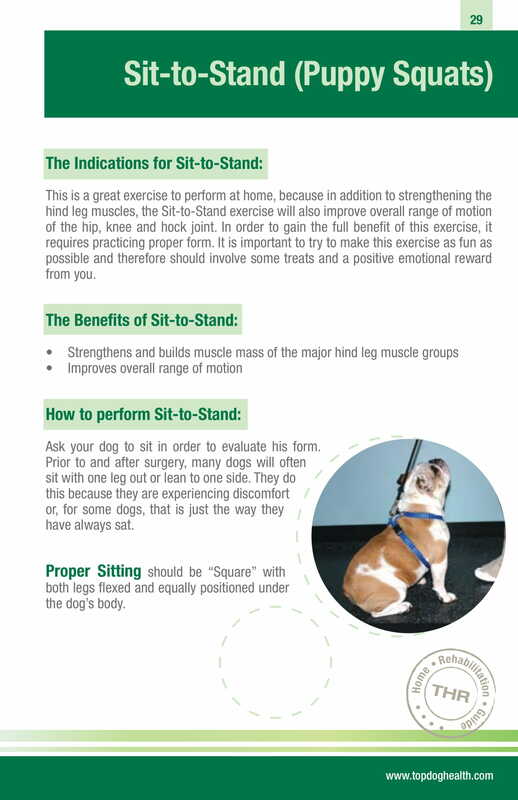 Sit-to-Stand The second most important muscle strengthening exercises you can do to build hind leg muscle. Proper form is key and we tell you how. Slow Controlled Hill Walks A simple introduction of hills at the right time can make a immense difference in muscle develop. Yet to soon could be a very bad thing. Inside we explain. Stair Climbing Almost all of us have them in our house, but incorporating them too soon could be a disaster. Learn when and how to use stairs to your advantage for a successful recovery. Swimming One of my favorite exercises, but you have to be careful getting in and out. Weight Shifting A simple exercise that you should be doing from day one. My name is Dr. James St.Clair, and I am the Founder and Director of Veterinary Medicine here at TopDog Health. In 2004, we opened our first veterinary rehabilitation facility focused on helping dogs recovery after surgery. I quickly realized that their were two MAJOR problems for pet owners. 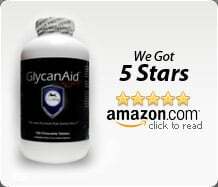 Since then TopDog has helped tens-of-thousands of pet owners have access to this vital information and best of all we are going to help both you and your dog today. We BELIEVE in YOU. 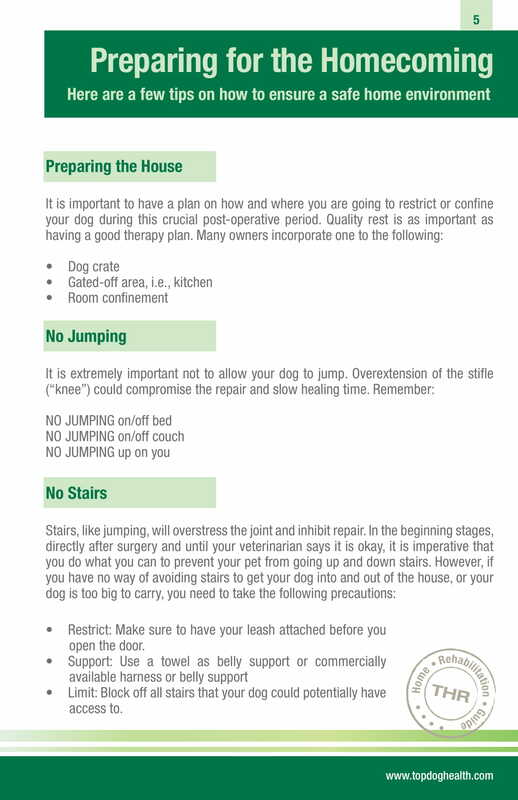 It is a fact that your dog can achieve a FULL recovery, but you need the RIGHT PLAN and the RIGHT INFORMATION. Pet owners unanimously say that TopDog over-delivers in everything we do, from the wealth of free information we provide, to the incredible quality of our products, to our honest and caring customer service and support. The proof is in the results. Click here to read what other pet owners have to say about TopDogs information. Don’t wait another minute. Please allow us to help your dog. 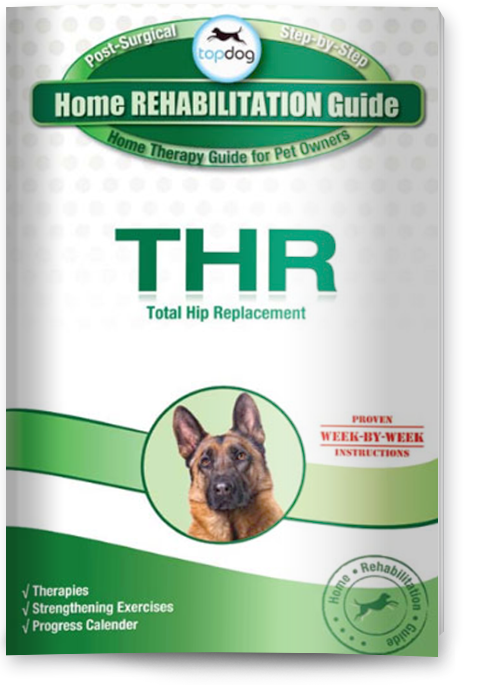 Simply download your free home rehab Book and start educating yourself on how you can help your dog recovery today. Educating your clients about the importance of post-surgery therapy and rehabilitation is critical. In addition, it is imperative that this information comes directly from your hospital, their trusted source for information. TopDog’s Home Rehabilitation Books provide a simple solution to this problem. Want us to send you a free copy? Are you interested in learning more about our veterinary professional’s discount? 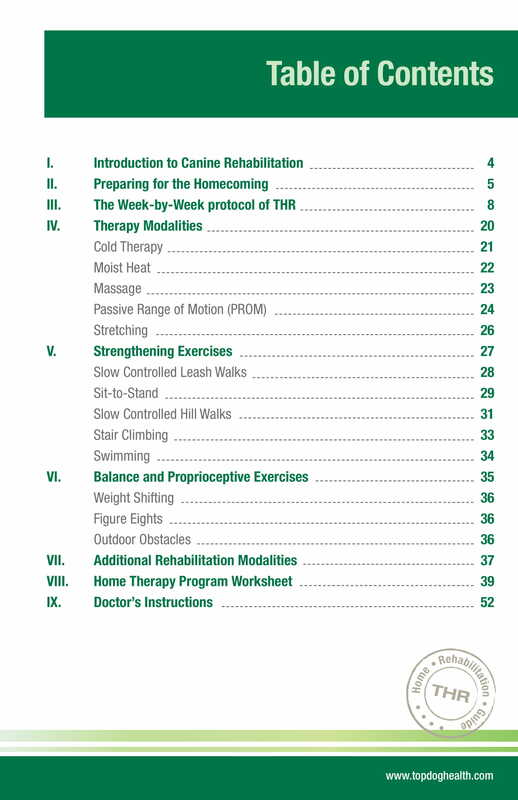 Email info@topdoghealth.com and join the hundreds of other veterinary hospital which use these as the go-to guides for post op client instructions.